U.S. electrified blues rockers RIVAL SONS have announced plans for their first ever full North American headline tour to happen in early 2019. 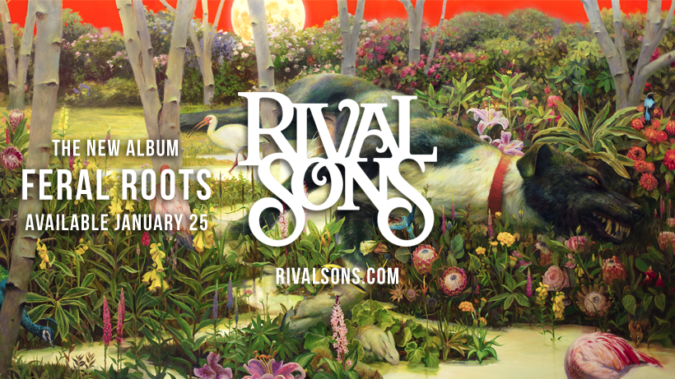 The tour will be preceded by a new album release from RIVAL SONS as ‘Feral Roots‘ is set to drop from Low Country Sound / Atlantic Records everywhere on January 25th, 2019. ‘Feral Roots‘ was produced by the band’s longtime collaborator and Grammy Award-winning producer Dave Cobb at Nashville’s famed RCA Studio A and the equally legendary Muscle Shoals Sound Studio in Muscle Shoals, AL. The album marks the band’s first outing for Low Country Sound / Atlantic Records and features cover artwork painted by renowned contemporary artist Martin Wittfooth. ‘Feral Roots‘ finds RIVAL SONS firing on all cylinders as only they can, from blisteringly incendiary rockers, to laid back sweltering blues. There are two fine examples of this now available with the band’s official video for “Do Your Worst“, and the audio-only clip “Back In The Woods“, both tracks hailing from the upcoming release. ‘Feral Roots‘ is available for pre-order now, with exclusive pre-order bundles – including limited edition vinyl and autographed lithographs of the Wittfooth designed cover art – available at the band’s webstore HERE.